you have to talk to people? what to say to your customers? you're afraid to approach them? Well, you've come to the right place. Over the years, I have struggled with my own shyness. I have dreaded having to speak in front of an audience. I've had the butterflies in my stomach while the TV camera was glaring at me. I have stumbled over words while trying to figure out how to answer weird questions from customers. Over the years I have managed to overcome my shyness in order to become more successful as an artist. It hasn't been easy. I am still in the process of learning. And, I still don't always come up with the right thing to say in the moment. However, what a difference compared to how I was just a few years ago. Now, I can be comfortable in front of an audience. Now, I have a list of answers ready for the common questions that I get. Now, I can be interviewed on camera without tripping over my tongue. And, you can do this too. It's really not that hard. I am writing this series of guides to help you to learn the things I have learned over my years of doing arts & crafts shows. 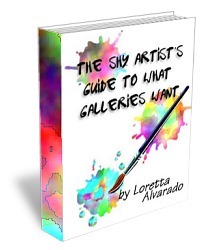 Below are just a few of The Shy Artist Guide books that I am working on. Well, I've been on both sides. I have been an artist for over 15 years and a gallery owner for three. As an artist, I know how hard it is to get up the courage to approach a gallery. As a gallery owner I know how hard it is to say no to an artist. Click on the book to purchase your very own down-loadable copy. 1. Get up out of your chair and spin around three times. 2. Go find a mirror. 3. Stand in front of the mirror and say "I am an artist." 4. Now say, "I am confident." 5. OK, now turn around three times and repeat steps 3 and 4. Did you do all that? Because these final two steps won't work if you don't. 6. Go to The Shy Artist Facebook fan page and Like me. 7. Now click on the "Exclusive" tab on the left side of the page and follow the instructions. If you're in a hurry and you really just want to read the book, skip to step 6. --- This one is almost done! --- Like the classic, "How long did it take you to make that?"